Bicycle 105 km along the banks of the Rhine River. 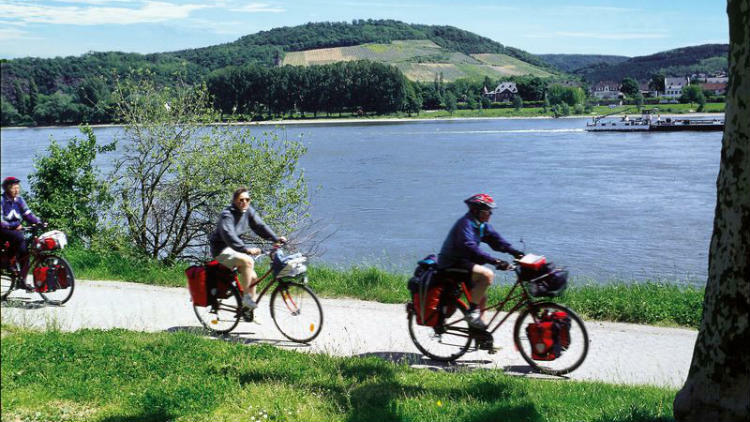 You will pedal past many historic sites on this 2 day bike ride along the Rhine, starting at the Speyer Cathedral continuing 105 km on predominantly asphalt trails, mostly free of auto traffic. Along your way, you will stop in the historic city of Worms where you can sample the local Liebfraumilch or explore the former imperial city during your evening. On Sunday, you will continue downstream to Mainz, ending your ride at the 1000 year old Mainzerdom. This one way ride is flat and family friendly, suitable for younger riders with the endurance for long distance bicycling. Saturday night in Worms will allow you to rest and recharge your batteries and you won’t need to worry about carrying clothes and supplies either, a chase van will meet you at various points along your route and transport any unnecessary weight to the hotel for you, allowing your muscles to get the maximum performance.